Glass melted in a high-temperature furnace is applied to the tip of a stainless steel pipe called a blowpipe. The glassblower blows into the pipe and causes the glass to inflate like a balloon, creating various forms. The glass is then placed in a cooling furnace known as an annealing furnace, and slowly cooled until it is finished. In the style called free-blowing, the breath blown into the pipe forms the shapes freely, and different shapes can be created depending on the way of blowing or moving the pipe. 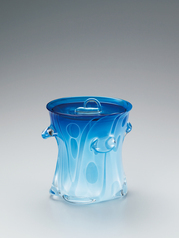 In mold-blowing, glass is blown into a wood or metal mold, and large numbers of the same form can be created. The shape or thickness of glass creates beautiful variations in transparency and light refraction. Combinations of clear glass and colored glass produce beautiful results as well.